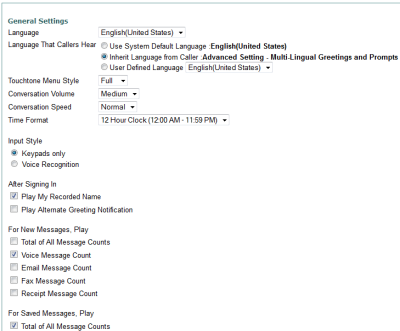 Use the Messaging Assistant to change your message settings, which includes greetings and notifications. 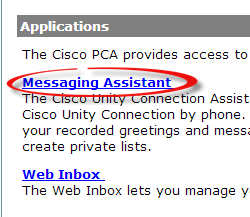 Click Messaging Assistant upon logging in. 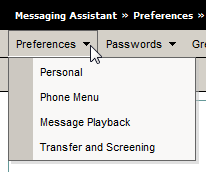 You will see the following menu options across the top of the screen: Preferences, Passwords, Greetings, Notification Devices, Contacts, Private Lists, and Help. 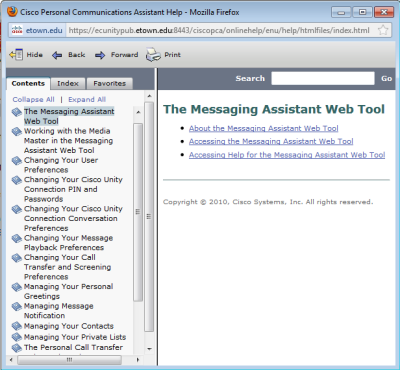 Personal Options: The Messaging Assistant tool will open to the Preferences - Personal Options page. You will see the number of your office phone under Phone Numbers. 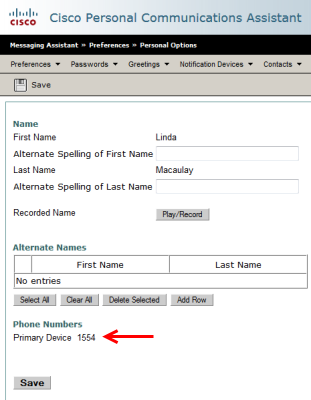 On this page, you can change the spelling and recording of your name as it appears/sounds to callers. Phone Menu: Change general settings, such as language and various play options. 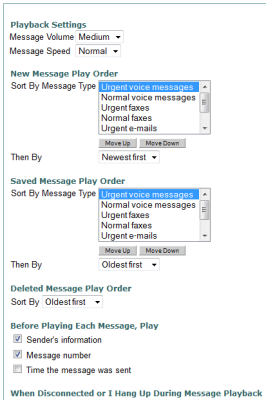 Message Playback: Select your message playback options, including how the messages are sorted. 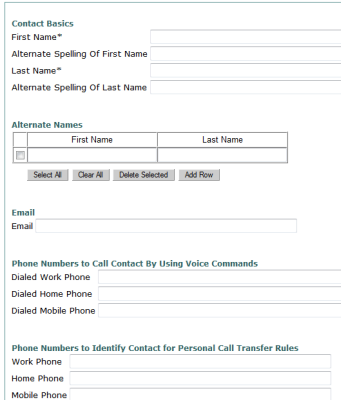 Transfer and Screening: Choose what callers leaving a message can do. 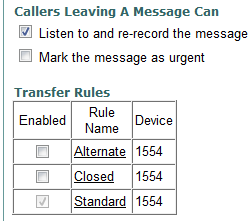 Set transfer rules for transferring calls. Change PIN: Enter a new PIN for your phone. 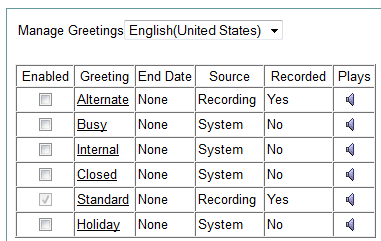 View Greetings: Select which greeting is enabled. Play greetings that have been recorded. Record new greetings. 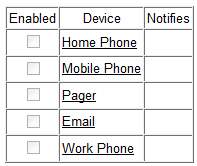 View Notification Devices: Set up devices such as your cell phone or e-mail to receive notifications like voicemail. View Contacts: View that contacts that you have saved on your phone. New Contact: Create a new contact. Import Contacts: Import or update contacts from your Microsoft Exchange account (Outlook contacts). Private lists are groups of contacts that you can send a message to. When you send a message to a private list, all members of that list will receive the message. 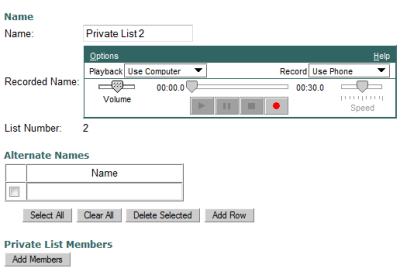 View Private Lists: View the private lists that you have created. New Private List: Create a new private list. Contents: Opens a window containing the Help guide for Cisco CPA. This page: Opens a window with the Help guide open to the section corresponding to the page that you are on. 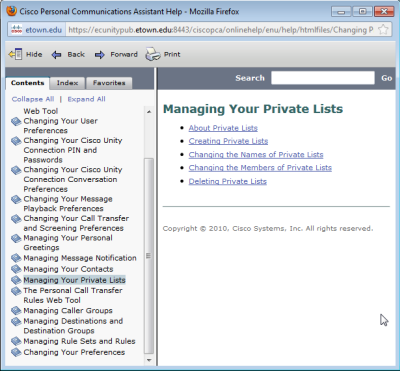 For example, on the View Private Lists page, This page will open the Help guide to Managing Your Private Lists. 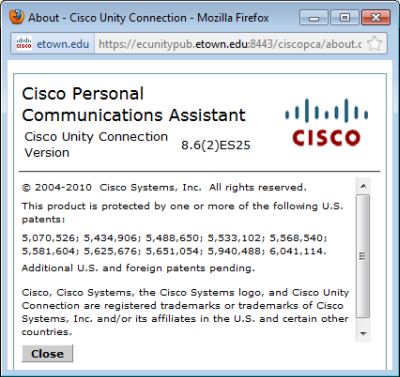 About Cisco Unity Connect: Opens a window with Cisco CPA version information.